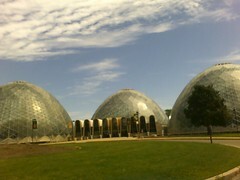 The Domes are an obvious landmark in Milwaukee. This is horticultural heaven, with the Tropical, Arid and Floral Show domes. It’s kind of funny, because they have been there for my whole life (or at least since I was two) and I went on numerous family visits and school field trips there, but I haven’t been there now for probably (gulp) 16 or more years. I was taking the kids down to meet my parents for lunch at our favorite Mexican place, Botanas, and by some freak of nature was running early. I didn’t really want to get to the restaurant and drag them in to sit there by myself, and Drue just happened to spot the Domes from 35th Street. For fun, I decided to drive over to them for her to see. She was in awe – fascinated by these things. I couldn’t believe how EXACTLY THE SAME they were – particularly the zig-zaggy entrance way. Just driving up there brought back a flood of memories, including what I can even imagine the smell was inside. I’m glad we saw the Domes that day – next time we’re looking for something fun to do, we are going there! It’s a great photo-op heaven, and I’m always looking for those! To get an even better idea of the domes, and because I can’t (YET) provide my own photos of them, check out the “official” web site.